Okay, so your little one is moving around the house getting into EVERYTHING! Whether it is crawling or walking, it is time to make sure your little one is safe from harm. A little bump creates tough skin. However, a big bump can be life-threatening. Here are the products I suggest when baby proofing your house. 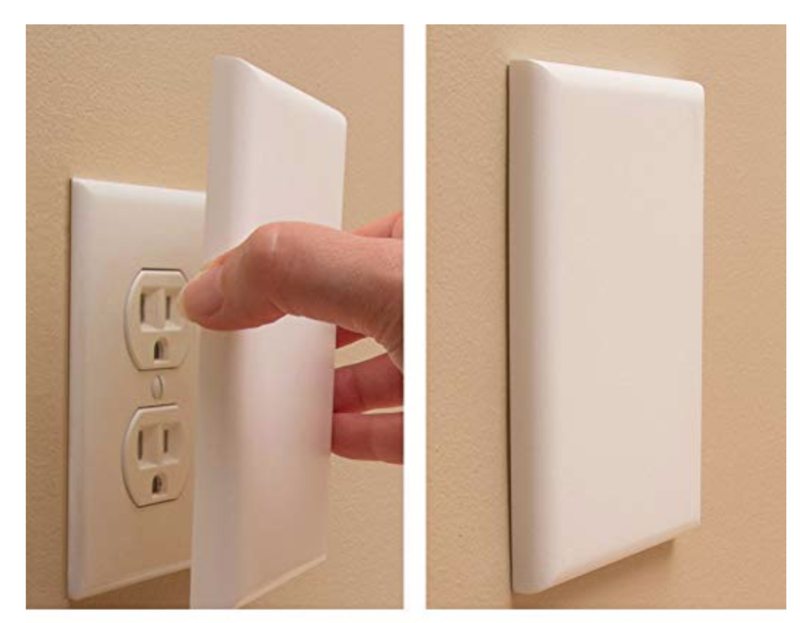 There are three types of outlet covers I suggest, and I will give you the reasons why. Plug protectors are perfect for when you need to use the outlet from time to time. For example, I have a specific outlet that I use in my living room when I vacuum. It is super easy to pop in and out when needed while keeping your little one safe from harm. My partner and I room share with our son (temporarily), and our room is awkwardly built. There are outlets in the most inconvenient places. One of them so happens to be on the wall where our sons' crib is. Once we lowered his crib, we had to move his crib down a few inches because of the outlet. I purchased the OutSmart Outlet Shield and was able to keep my son’s crib where it intentionally was positioned. Along with the fact that we don’t use that outlet for anything. This cover is excellent for reachable outlets that you don’t use. This outlet cover is excellent for functioning outlets that are within reach for your little ones. It prevents them from playing with the outlet and the cords. IMPORTANT: Never place or remove outlet covers in front of your little ones. Babies love things they can't have, seeing you place or remove the outlet will feed their curiosity to play with this new “toy.” Remove your little one from the room or distract them. If you have a crawler, this may not be needed just yet. If you have a walker like me who tries to opens doors himself like a big boy, this is a must-have. I have a door that goes down to my basement, and I would be mortified if he were to ever fall down them. It seems like babies are prone to pinching their little fingers often, especially when they have older siblings they like to follow from room to room. This guard prevents babies from hurting their precious little fingers. There is just something about the corners of tables and tv stands that make my skin crawl when your baby starts to walk. It seems as though they always seem to fall near it. With these bumpers, you can keep your little one safe from harm. Gates are a must! There are so many types to choose from, but I am a fan of the old fashion wooden ones. Barriers prevent your little one from entering into rooms or areas they are not allowed. When my little ones enter the kitchen, he loves to play with the knobs; I'm assuming it because he sees me use them when I am cooking. Sometimes we aren’t aware that our little ones have touched the knobs and turned our burners slightly on. With these knobs, your little one cannot set the knob. Trash can with a lock. My partner and I purchased this trash can, and it has been amazing. My little one loves to lift the lid and I’m sure he will try to throw things away eventually. With the lock, your little one isn’t able to open the lid. IMPORTANT NOTE: never lock and unlock in front of your little ones. Kids are smart and will figure it out from watching you. There are a MILLION (I’m exaggerating) other baby proofing Items out there. I never went to the extreme and purchased a majority of them. However, as a mom, it’s better to be safe than sorry. I knew my baby didn’t have free range, so I was able to catch him in the cabinets, etc. The items mentioned above are the ones I feel are a MUST starting out. As your baby becomes older and smarter, others may be needed. You can also purchase a baby proofing kit. What are your favorite baby proofing items?